Coriander appears in so many different cuisines that it can be hard to determine where the plant first originated. We know by its Latin name, Coriandrum sativum, that coriander has been cultivated by humans for a long time (sativum means “cultivated” in Latin). The seeds have been found in ancient Greek and Egyptian ruins that are thousands of years old. Coriander seed essential oil is commonly used today as a appetite stimulant, energizer, and detoxifying oil for the whole body. An annual herb in the carrot family Apiaceae, coriander is a soft plant with feathery roundish leaves and small pale pink or white flowers that bloom in clusters called umbels. Coriander is native to Southern Europe, North Africa and Southwest Asia. 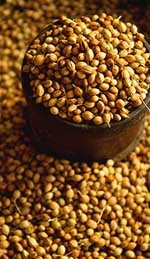 As a testament to its status as an ancient food, preserved coriander seeds have been recovered from the Stone Age level of the Nahal Hemel cave system in Israel; today, coriander seeds, leaves, and even roots are widely used in cooking, especially in Indian, Southeast Asian, and Mexican dishes. In fact, the common English word for coriander leaves, cilantro, is taken from the Spanish word for the plant. The word coriander most likely comes from the ancient Greek koriadnon. It may be related to the Greek word koris, meaning “stinkbug”, since the Greeks believed that the smell of crushed coriander seeds had a similar pungent aroma! Interestingly, modern studies have suggested that genetic factors are at the root of some people’s dislike for the smell and flavor of coriander when used as a garnish or cooking spice: a minority of people are sensitive to unsaturated aldehydes in coriander, which causes them to perceive an offputting “soapy” smell or taste in coriander leaves and seeds. However, history attests that most people love the smell and taste of coriander: the ground seeds are used as a spice in classic Indian and Southeast Asian curries, and even added to Belgian beer during fermentation to impart a hint of citrus to the completed brew. The seeds are also used to flavor Chartreuse liqueur, and may be added to rye bread as a substitute for caraway seeds when those aren’t available. There’s another very good reason why coriander is so popular in cuisines worldwide: coriander seed has beneficial regulatory effects on digestion, and can relieve wind and indigestion . Coriander seed essential oil may be used in massages to address digestive complaints, ease muscle and joint pain , and act as a general detoxifier for the body . A warming, uplifting oil, coriander essential oil is also inhaled to stimulate the senses and clear away mental fog; its energizing aroma can banish weakness and fatigue, and may be helpful in treating tension headaches . Blend it with woody or spicy oils such as cypress, cinnamon, ginger, pine, and sandalwood for a truly memorable fragrance that leaves you feeling clearheaded and ready to tackle your day. 1. “Supplements – Coriander Seed”. Whole Health MD. Last modified January 31st, 2012. http://www.wholehealthmd.com/ME2/dirmod.asp?sid=&nm=Reference+Library&type=AWHN_Supplements&mod=&mid=&id=D9238582508B46AC904444CA24C434A5&tier=2. 2. “Health Benefits of Coriander Essential Oil”. Organic Facts. Accessed June 17th, 2014. http://www.organicfacts.net/health-benefits/essential-oils/health-benefits-of-coriander-essential-oil.html. 3. “The Health Benefits of Cilantro”. Global Healing Center: Natural Health and Organic Living. Last modified May 5th, 2014. http://www.globalhealingcenter.com/natural-health/health-benefits-of-cilantro/. 4. Victor, David. December 30th, 2009. “Use Herbal Remedies for Headaches”. NaturalNews: Natural Health News and Scientific Discoveries”. http://www.naturalnews.com/027830_headaches_herbal_remedies.html. This entry was posted in Aromatherapy, Essential Oils and tagged detox essential oil, essential oil for indigestion on August 23, 2013 by Keith Cleversley. The Greeks were using juniper berry oil as medicine long before the Romans, and the Indians and Egyptians were using the berries for food as well as for offerings to people who were making the transition to the afterlife before the Greeks realized what juniper could do for health. Remnants of offerings found in Egyptian tombs include juniper berries. The Romans finally caught on and used them to enhance the flavor of pepper, according to Pliny the Elder’s Natural History encyclopedia. 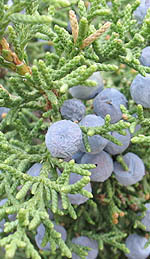 Juniper berry oil is extracted from Juniper cones or berries by steam distillation, but some oil is made using the needles and the wood of the plant. The quality of that oil is not as good as the oil made from the berries. In Central Europe, the oil was used for gastrointestinal infections and rheumatism, and in France, hospitals came up with a process where juniper twigs were burnt with rosemary to protect patients from infections. When juniper oil is made from the berries, therapeutic properties surface. These are: antiseptic, antispasmodic, astringent, antirheumatic, antitoxic, diuretic, depurative, nervine, emmenagogue, sedative, and rubefacient, which make this oil a perfect aromatherapy remedy for a number of health issues. Essential juniper oil is used for arthritis, gout, muscle aches and pains, oily skin, acne, rheumatism, and toxin build-up. Stress-related issues as well as nervous tension and anxiety can also be treated using juniper berry oil in aromatherapy. Juniper oil blends well with bergamot, basil, black spruce, black pepper, clary sage, caraway, lavender, peppermint, citronella, neroli, cypress, eucalyptus, petitgrain, pine, marjoram, rosemary and thyme, and that blending quality makes it a versatile essential oil. A large number of people who are very familiar and work with essential oils believe that the main use for the oil is for body and mind detoxification. Juniper oil contains monoterpenes: myrcene, limonene, sabinene, pinene, and camphene, as well as terpinenol and borneol are beneficial for the intestinal tract, acting as purifying and antiseptic agents as well as stimulants. Juniper is considered the best aromatherapy oil for treating urinary stones, cystitis, and pyelitis. The chemicals in the oil actually flush out free radicals that invade the blood stream and enter the cells in the organs. When juniper oil is massaged into the body or is used in a dilute bath, it relieves muscle cramps and conditions the skin, and when it is inhaled it goes to work on the internal system as well as the mind. Juniper oil impacts the emotions as much as it impacts the free radicals that create illness. Essential juniper oil purifies the body physically, and it’s a spiritual plane cleanser as well, especially when emotionally draining situations or people interfere with balanced mental vibrations. This entry was posted in Essential Oils and tagged detox essential oil on January 20, 2012 by Keith Cleversley.